What is the best beginner Lenormand deck? There are so many Lenormand decks on the market that it's easy to feel overwhelmed when trying to choose which one you should start with. There are traditional decks, photographic decks, art nouveau decks, themed decks, decks with verses, decks with playing card insets – anything you can think of, there's a deck to match. And prices range from expensive privately produced decks to more economical commercially produced ones. Whether you're just testing the waters with a Lenormand deck or are looking to become a devoted reader, you want to wisely purchase your first Lenormand deck. Before you buy a Lenormand deck, there are some things you may wish to consider. It's normal to pick a deck by art work alone, choosing the one that is the most appealing to you visually. But this isn't always the best idea with Lenormand. 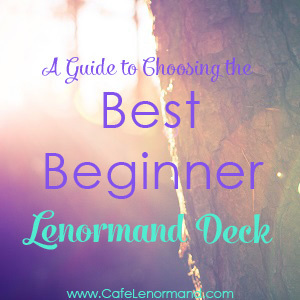 The more colorful or creative the imagery of a deck will not help you learn Lenormand. In fact, many people who have been reading Lenormand for 10, 20, 30 years and more will steer clear of such decks because they can muddle a reading. 1. The best beginner Lenormand deck is one where you can make out the images easily. You want to be able to quickly tell the cards apart, and to easily identify each card. Clear images help you tap into your intution to know which card meaning applies; complex imagery creates delays while you spend your time trying to figure out which card is which. When you look at the Lenormand Dog card, you want to know that it is the Dog. You don't want to have search for it. You don't want to have multiple cards with a dog on them because you'll get confused and bogged down during a reading. Simple, clear images allow you to combine the cards, quickly learning an essential element of reading any Lenormand spread. 2. Pick a beginner Lenormand deck that has playing card insets. Traditional Lenormand decks have playing card insets on them because they are derived from a Piquet deck (an abbreviated deck of cards containing 32 cards). Many people feel that decks should no longer have the playing card insets on them because they don't use them. However, they are great for a beginner because they act as a cheat sheet, helping you to remember which cards represent people. Aside from the obvious Man and Woman cards, there are 15 Lenormand cards that represent people. Instead of having to memorize that the Crossroad can represent a woman, if you're using a deck with playing card insets, the Queen of Diamonds is there to remind you. 3. The best beginner Lenormand deck is numbered 1-36. The cards in a Lenormand deck are referenced by the same number regardless of which deck you are using. However, when you are first learning Lenormand, it is helpful to have a deck with the card numbers on it because it makes it easier to identify cards. A deck with numbers also makes it easier to read a Grand Tableau when first learning. There is a reading technique called houses in which the placement of a card matters. A deck with numbers can serve as a guide to help you to know which card is represented by a house by comparing the card placement to the card number. For example, if a card falls in spot 11, you can look to the numbers on your cards to quickly discover that spot 11 correlates with card 11 – the Whip. 4. Choose a deck with smaller cards. Before you buy a Lenormand deck, you should consider that one of the best Lenormand spreads, the Grand Tableau, uses all 36 cards. You want to make sure that the deck you buy is small enough to lay out all 36 cards on a table. This is why most Lenormand decks have smaller cards. Smaller cards also make it easier to read a spread, particularly a Grand Tableau. You want to be able to quickly look at the cards to see how they relate to each other. When you start employing advanced reading techniques, you will see that every card in a Grand Tableau connects to every other card in the spread. You need to be able to see all the cards easily to make these advanced connections. This again brings us back to the importance of clear images. Because you want smaller cards, it's even more important to be able to quickly identify the cards. You want to be able to tell the difference between the Bouquet and the Lily, the Tower and the House. You don't want to be using a new interpretive deck where you have to figure out if a bridge crossing is the Cross card or if an airplane is the Birds card. Some people think the best beginner Lenormand deck is a traditional deck. I disagree. The card meanings don't change from deck to deck, so a modern deck will have the exact same meanings as a traditional deck. I will admit that most traditional decks are easier to read. The images are much clearer and to the point, while many modern decks have a theme or artists have tried to reinterpret the cards. There are even some modern decks where the deck was created by artists unfamiliar with or very new to Lenormand. Sometimes this shows in the imagery. The decks may mix images (such as a dog on more than one card) or the images might mix up card meanings (such as connecting the Snake card with imagery related to death or imagery related to bad luck – walking under a ladder, broken mirrors, and the like). Such decks can be confusing for beginners. However, there are modern decks that make great beginner Lenormand decks, and there are more coming onto the market. Here are some decks I suggest for beginners. It includes both traditional and modern decks. 1. The French Cartomancy Deck. This is the largest deck on the list, but I've never had a problem laying all 36 cards out in a Grand Tableau. They have easily fit on every table I've used. This deck has been a good friend since I first started using it. 2. Piatnik Lenormand – This was the deck I learned Lenormand with, and I still use it regularly. I could see it lasting for another 10 years or more, even with regular use. 3. Blue Owl Lenormand – This a great beginner Lenormand deck. It's a stunning and beautiful deck with high accuracy, showing it has stood the test of time for a reason. 4. Under the Roses Lenormand – This is a modern deck that works very well for beginners. It offers a clean, modern design with all the elements of a deck that will help you quickly learn to read Lenormand. Also, I have a question about my Lenormand deck that I already have. I am a beginner, and the deck I have is called “Dreaming Way”. When I went to buy a deck (I had Tarot in mind, actually. I didn’t know about Lenormand at that point), this deck stuck out to me, along with another, Tarot deck. I chose the Lenormand deck because it was financially easier for me. Is this a good deck to start with? It has card numbers, 1-36, and it doesn’t have playing card inserts, but it does indicate which playing card is associated with each card, i.e. 8 of hearts for the moon card. Also, some cards do have repeated images. The snake card shows a snake curled around a woman, and the fox card has a fox draped around a woman’s deck. If this isn’t a good deck to start with, then I will buy one of your suggested decks. The Under the Roses deck looks appealing! It isn’t one I would use as the duplicated images can be confusing when trying to read the cards. However, if the repeated images don’t bother you or cause confusion when reading the cards, then continue to use it. Hi. I’m a beginner and had been practicing on a Gilded Reverie Lenormand deck, which unfortunately disappeared. I haven’t replaced it yet, unsure whether to purchase the same or try a different one. I remember reading that you can make your own. I was thinking that it would be personal and perhaps it would give me more insight when I do a reading. Do you think that this is a good idea or should I just pick one of your recommendations. If I do make them, I would use a guide deck that includes the playing card inset. And I would follow your advice as well. As a creative person, I am excited to make them but I really need a deck that’s going to help me learn. Thanks for your help. My one caution is that often when I see people making decks to learn Lenormand, there are errors in the deck. Often they’re more Lenormand influenced than actual Lenormand decks. This can make it more challenging to learn the cards. I think having a full understanding of the meanings of the cards can help to create a more accurate deck. However, if you’re careful with the images you select, making sure they are true to Lenormand, you should do well. If you choose to purchase one, all of the decks on this list are great for beginners. The Piatnik deck is the first deck I used, and the deck is still in very good condition after 10 years of use. My French Cartomancy deck did well until my dog ate it – no fault to the cards. My Blue Owl is easy to read and as sturdy as the Piatnik. Under the Roses is great if you’re just learning as it has the meanings on the cards. What do you think of the Alexandre Musruck Lenormand Oracle Cards for beginners? I have mixed thoughts about Alexandre Musruck’s Lenormand Oracle cards. Most of the cards are designed well with a vintage look. It has gilded edging and is a good size for Grand Tableau spreads. However, I think some of the images could be confusing for beginners, such as the Clouds, Crossroads, and Clover. For example, if you read the Clouds card based on the dark side on the left and the light side on the right, this deck can be challenging as the Clouds card doesn’t have a dark/light side. I think beginners can also have trouble with the image of the Clover card as it doesn’t really look like a clover (but bees amongst flowers), nor does the Crossroads look like a crossroads (but more like a crooked street, such as Lombard Street in San Francisco). I think this would be a great deck for anyone who has some practice with Lenormand, but I don’t think it’s ideal for someone just beginning. do you have any experience with the Fairy Lenormand Oracle? is it okay for a beginner? Hi Azeara – It’s a beautiful deck, but I wouldn’t recommend it for a beginner. The images can be a little busy and quite non-traditional. If you aren’t familiar with Lenormand, you’ll probably have to work harder to figure out what each card is. I also think it would be difficult to read other Lenormand decks if you begin with this one. I recommend a more traditional deck, like the ones I mention above. Once you are familiar with card meanings and know what card is each card number (for example, you know that the Rider is card 1, the Clover is card 2, etc. ), then you should be fine working with this deck. I’m a beginner,I have a tarot le normand 3 in 1 version,normal tarot and,le normand,but it is kind of confusing because the pictures on some are confusing!! I just use regular tarot!! I think it was made or illustrated in italy!! Does anyone have the same set of cards!!? Hello! I am beyond new to Lenormand and am just starting study the topic. A little about me. I would say I am not the typical person to be interested in the subject. I do not consider myself spiritual …I’m much more analytical. I had a reading that blew me away. Now it seems when things in my life are unsettled or unclean I turn to readings. Welcome to Lenormand Chuck! I’m glad you’re enjoying the cards and are finding them helpful. Pixie’s Astounding Lenormand is a beautiful deck, based on Pamela Colman Smith’s version of the Rider-Waite Tarot. The cards don’t have playing card insets on them (playing card insets can help you quickly identify which Lenormand cards can represent people when you’re first learning Lenormand). Otherwise, the cards are easy to read and produce readings that are blunt and accurate. I’ve seen the Zennormand deck used. It seemed pretty self-explanatory. I’ve been playing with the Maybe-Lenormand deck which I get a little confused with sometimes. What do you think of these decks for beginners? Thank you for your help. I don’t recommend the Maybe-Lenormand deck. I understand why you would get confused with it because it isn’t a Lenormand deck. It has 16 cards which are not a part of the Lenormand system. A Lenormand deck only has 36 cards and those cards contain the meanings that the 16 cards in the Maybe Lenormand deck are used for. I’d get pretty confused myself! I haven’t heard of the Zennormand deck. I tried looking it up through Google, Amazon, and a few other places, but I couldn’t find a reference to it anywhere. If it matches the criteria I listed above (numbered cards, only 36 cards, clear and easy-to-understand images, and paying card insets), it might be okay for beginners.